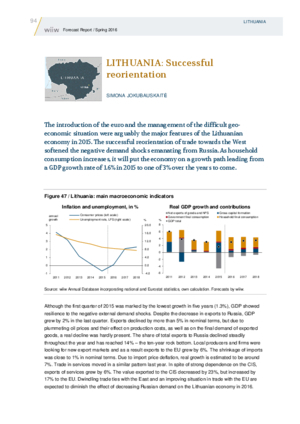 The introduction of the euro and the management of the difficult geo-economic situation were arguably the major features of the Lithuanian economy in 2015. The successful reorientation of trade towards the West softened the negative demand shocks emanating from Russia. As household consumption increases, it will put the economy on a growth path leading from a GDP growth rate of 1.6% in 2015 to one of 3% over the years to come.